The new NBA regular season gets going on October 16th, so it's a good time for ball fans to work out how they'll watch the action. Cable subscribers will already have options, but for everyone else, there are also online-only alternatives. The NBA offers its League Pass through various platforms and apps, and it's now available through YouTube TV. Just before the price hike from $35 to $40 came into effect, YouTube TV announced that NBA TV and MLB Network were being added to its roster — subject to an additional fee, of course. 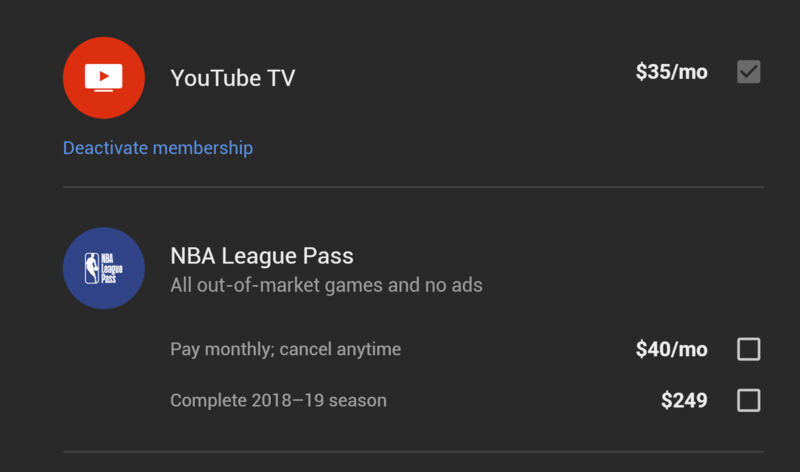 According to emails sent out to subscribers, NBA League Pass went live for YouTube TV on October 1st, with a Google support page giving more information on what's included. There are only two payment options, as discussed by users on this Reddit post. You can get NBA League Pass Premium for either $40 per month or $249 per year, but it's not possible to get the cheaper $29 per month/$199 per year non-premium plan that's available direct from the NBA. That means it's commercial free and comes with in-arena streams, but some users would probably have preferred the less expensive option. This is only really worth buying if you already have a YouTube TV subscription and were prepared to fork out for the Premium Pass anyway. And while it might be a more expensive way of doing things, the YouTube TV experience will almost certainly beat the NBA's own apps.